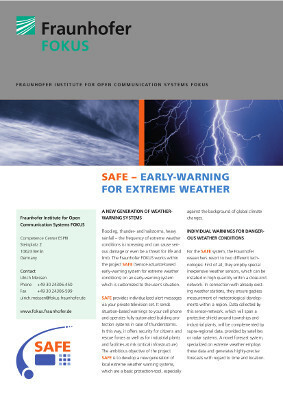 SAFE (Actuator-Based Early-Warning System for Extreme Weather Conditions) is a extreme weather warning system that sends forecasts by means of individually selected media (e.g. email, SMS) in specifically defined areas, from industrial locations to the local authority, promptly and specifically for that area. In addition, SAFE also can initiate automatic active defense processes (e.g. controlling building technology). Thanks to the affected residents, authorities and companies being warned promptly and in a targeted way, appropriate protective measures can be introduced and storm damage can be contained significantly. SAFE entered its pilot phases in the southern German market town of Mering as well as at Wacker Chemie AG in Burghausen in 2008. Automatic building protection mechanisms, individual warning messages on private television and situation based warnings on mobile phones were tested in Mering. In addition, relief workers were able to access an overview of the situation, a colleague position display and location based warning maps on their mobile phone. Mering was named as a chosen area in the country of ideas (“ausgewählter Ort im Land der Ideen”) by Federal President Horst Köhler on 26 June 2010 for its use of SAFE.